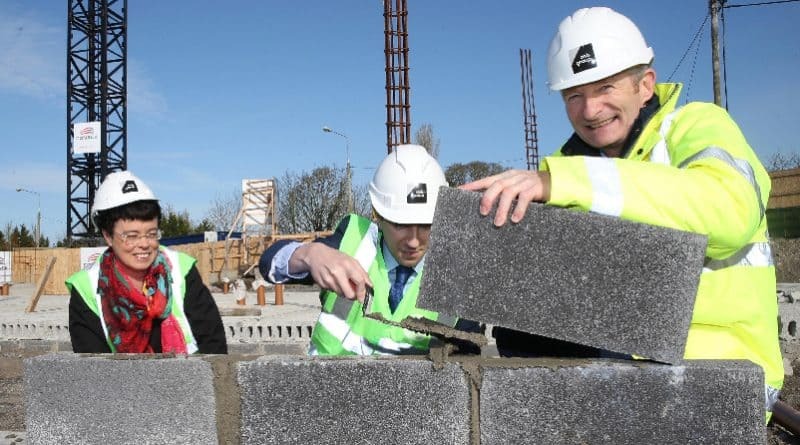 Minister for Health Simon Harris TD has visited the Athy Primary Care Centre development in Co. Kildare to review progress on the site, which is due to be completed by early 2020. The €11 million development on the Dublin Road will host HSE primary care services including public health nursing, speech and language therapy, occupational therapy, physiotherapy, dietetics, community network disability team, counselling and Child and Adolescent Mental Health Services as well as a GP Practice and Mc Cauley Health & Beauty Pharmacy Group will be operating the pharmacy on site. Tusla will also occupy significant space within the centre. Designed by Quinn Architects, Conack Construction won the contract to build the 3 storey healthcare building. More than 50 people are employed in the construction phase of the almost 4,000m2 development in Athy. Developed and managed by Axis Group, a leader in facilities management of Primary Health Care Centres in Ireland, on behalf of UK based Primary Health Properties plc (PHP), the facility is expected to be handed over to the HSE in January 2020.